British Divers Marine Life Rescue tend to stranded pilot whales on the rocks of Staffin Island on the Isle of Skye. A group of pilot whales which stranded on Skye appear to have left the area. A check of the coastline yesterday by the British Divers Marine Life Rescue showed no sign of the creatures which sparked a two-day rescue attempt. The emergency started on Monday when a pod of 21 whales stranded in Brogaig Bay, near Staffin Island. A total of 18 were refloated and guided back to sea. Among the three dead whales was a pregnant female, which had to be euthanised after its calf died. However later in the day, it emerged that some of the refloated animals had beached on Staffin Island itself. By the time BDMLR arrived, four were dead, with another nine found alive. Two more had to be euthanised to end their suffering. Of the remaining seven whales, one remained in the shallows and then went off out of view. By 7.45pm, five were successfully refloated using inflatable pontoons. The remaining mammal took longer to refloat. 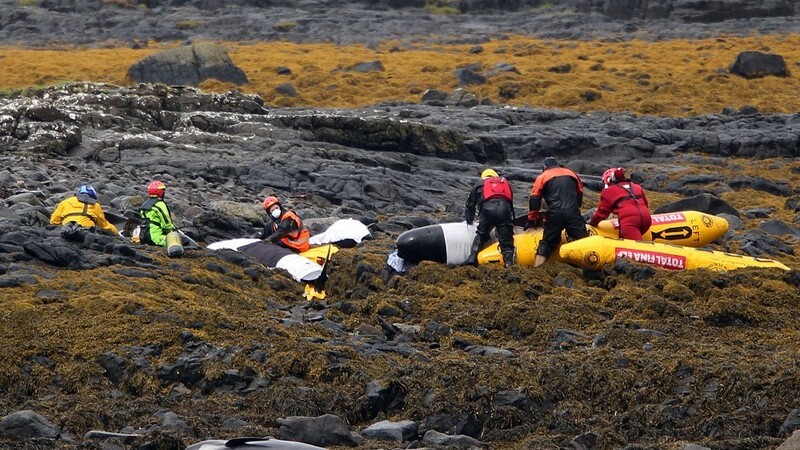 Post-mortem examinations will now be carried out on the bodies of the dead whales. The spokesman said that the whales were swimming strongly and it was hoped they made it to open water. He added: “This has not been the easiest of rescues and the dedication and actions of the BDMLR volunteers have received praise from grateful members of the public all over the world. Meanwhile, Environment Secretary Richard Lochhead has called for more research into mass whale strandings. He added: “Thankfully mass strandings such as this are rare in Scotland as they are in many countries across Europe. That is why I am calling for research into this issue to be co-ordinated internationally and taken forward at an EU level.